GUI | The Small Wave. And even before the Lisa, in 1981 there was the Xerox Star. The link above has a number of high-quality scans of the system. 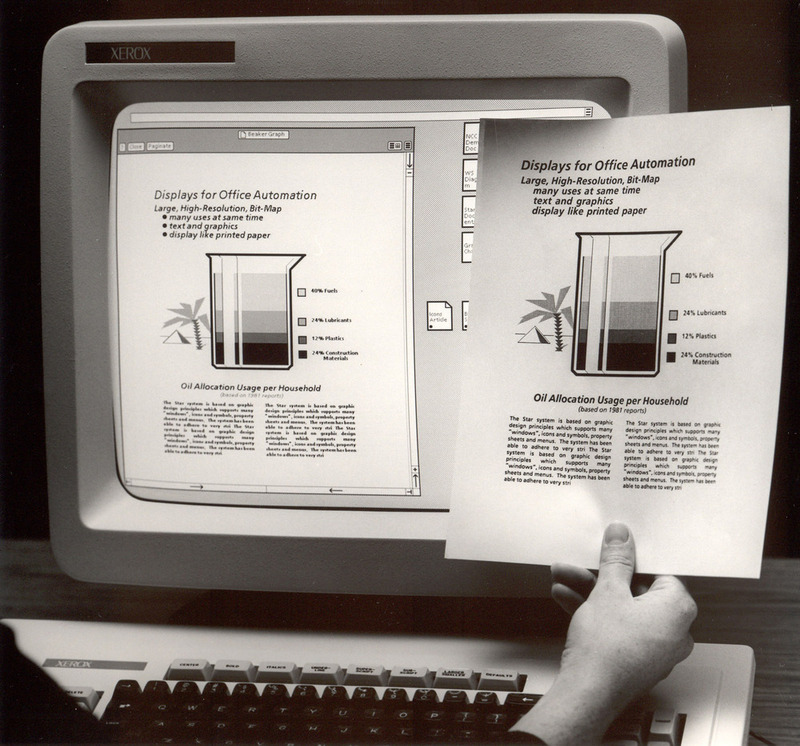 The Xerox Star was not originally meant to be a stand-alone computer, but to be part of an integrated Xerox “personal office system” that also connected to other workstations and network services via Ethernet. Although a single unit sold for $16,000, a typical office would have to purchase at least 2 or 3 machines along with a file server and a name server/print server. Interesting that in the above shot the printer didn’t get the bullet points you see on the screen. Seeing these two predecessors just three years before the Mac’s launch makes you appreciate the littlest Apple all that much more. At $2,500 it was truly remarkable. I saw a very rudimentary graphical user interface. It wasn’t complete. It wasn’t quite right. But within 10 minutes, it was obvious that every computer in the world would work this way someday. And you could argue about the number of years it would take, and you could argue about who would be the winners and the losers, but I don’t think you could argue that every computer in the world wouldn’t eventually work this way. Steve Jobs quoted in Wired, February, 1996. You can’t take the word “every” literally, but when I use the iPad I feel exactly the same way. The GUI took about six years to really take off (Windows 3.x was the key); I don’t think the touch interface takes that long. The quote was about moving away from the complications of the command line and moving to the GUI as we know it today. It’s a remark Jobs made based on seeing what Xerox PARC was doing. Basically, despite all its then-current faults, the GUI was, to him, obviously the way all machines would work some day. However, in the 25+ years since a mainstream GUI (the Mac) hit the market, they’ve become overly complicated in their own way, just as the old command line had. Too many applications, documents, file types, controls, preferences, networking, etc. to keep track of. Geeks know their way around it, but the average user today is nearly as confused by a modern GUI as a user was in 1983 by DOS. It’s this confusion that a touch-type OS simplifies. It isn’t just about touch, but about removing the complications of GUIs that have accrued over the years. To me, when I use the iPad I see something with now-current faults (just as the GUI had in the beginning), but it’s clear to me that every computer will eventually work this way. Further, though derided as a “toy” for years, the GUI finally broke through and took off like a rocket (at around the six-year mark). The touch OS will be the same. It’s already being derided as a toy, but the bigger difference is I don’t think it’ll need six years to really take off.